At the 2016 BuzzFeed Open Lab Showcase, Christine Sunu exhibited as series of internet connected objects with unusual sensors and displays. The Starfish Cat, also known as Burbles, is a cuddly and horrifying combination: half adorable cat and half oversized pink starfish. Burbles meows like a newborn kitten, kneads hook-like claws in the direction of your body heat, and attempts to suckle when you hug him. A machine that acts alive either thrills us (Wall-E) or terrifies us (the Terminator). Internet connected interfaces often provide lifelike functions: they react to noise, recognize our voices, and interpret images. We perceive each interface differently depending on how adorable, unfamiliar, and unpredictable it is. Products that straddle the line, providing cues for both the adorable and unfamiliar, are strangely unnerving. 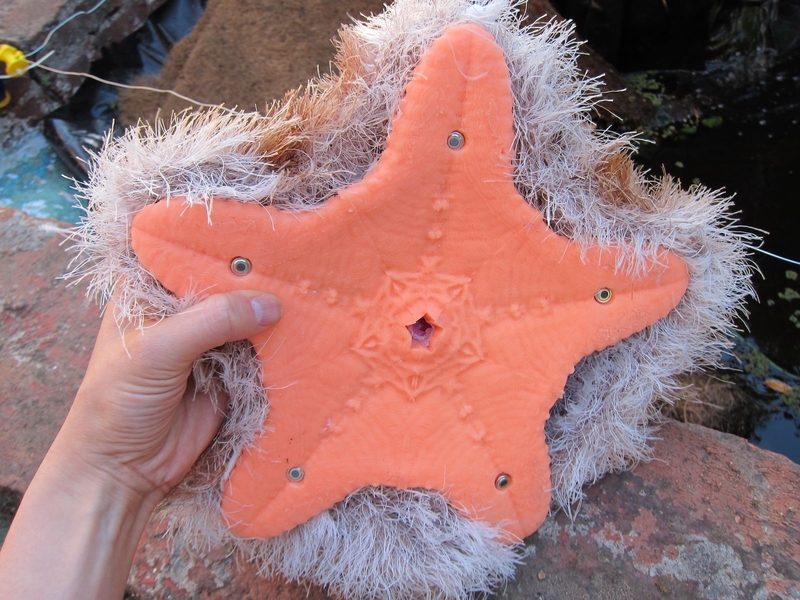 Starfish Cat serves as an example of the dangerous, powerful nature of lifelike cues, and how strongly they can bias a user's opinion in HCI. Starfish Cat senses and reacts to body heat. Five IR temperature sensors on its base look for body heat. If they indicate that the Starfish Cat has been picked up, the cat plays a recording of a needy kitten’s meow and actuates the claw servos nearest to the warmest temperatures. If the user is hugging Starfish Cat, they will feel it vibrate lightly from the pneumatic motor inside. If they hold it close enough, they will feel the suction-like effects of the motor. Animals always accelerate into movement. Even a Cheetah taking off at full speed preps first, tenses, and then runs. Robots, on the other hand, are usually more binary. They move at one speed; they are either on or off. By accelerating into each movement, Starfish cat feels unusually “alive”. Starfish Cat's claws accelerate in and out as they knead, making him a terrifying and cute half-alive robot. The sound herd is a flock of four Art Deco pigeon sculptures that locate each other in space and time. They each sing one note in an arpeggio. If you remove one bird, the rest sing the note of the missing bird until the flock is complete again. This is partially a ludic engagement hack, but it's also about device proximity and communication. Recognizing groupings at close proximity can be very tricky without a physical contact like a wire, magnetic switch, or copper plate. I wanted the birds to know if one of their flock was missing, and I didn’t want to use any physical contact to do it. I wanted them to be able to identify the missing bird if it was merely lifted out of the flock a foot away, and I wanted them recognize it when it returned. 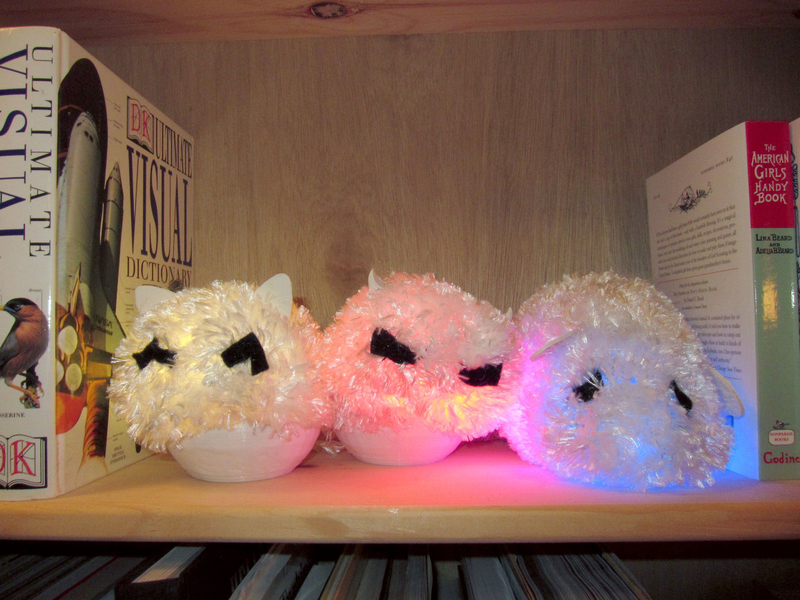 Each bird has a microphone and a conductive speaker to transmit data, as well as an internet connected microcontroller to sync their internal clocks. They have a color sensor, LED, and soft silicone wings. Squeezing the wings causes the LED to change to the color of the surface underneath the bird. When all birds are present, their LEDs change to show the average of the group’s color data. 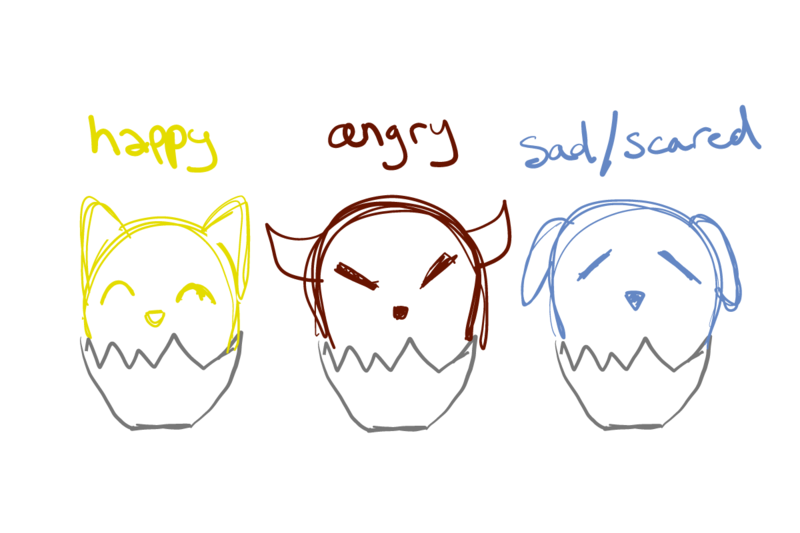 These three plushies-- happy, fearful, and angry-- respond differently to being squeezed. “Happy” pulses with gentle yellow light and purrs. “Fearful” flickers like a candle until it is squeezed or petted, and then it goes out. “Angry” glows bright red and vibrates more strongly the harder you squeeze it. Each “buddy” also streams data about how it is being handled to the internet. My display visualized that data on a large screen for all to see. I conducted a series of short experiments on people’s responses to color and vibration. I found that people often perceived long, harsh pulses of vibration as aggressive, and gentle pulses as encouraging. They avoided the color red in favor of other colors like blue or yellow. I wanted to explore coding these factors into stuffed animals, and looking at how that might change the way they were handled. 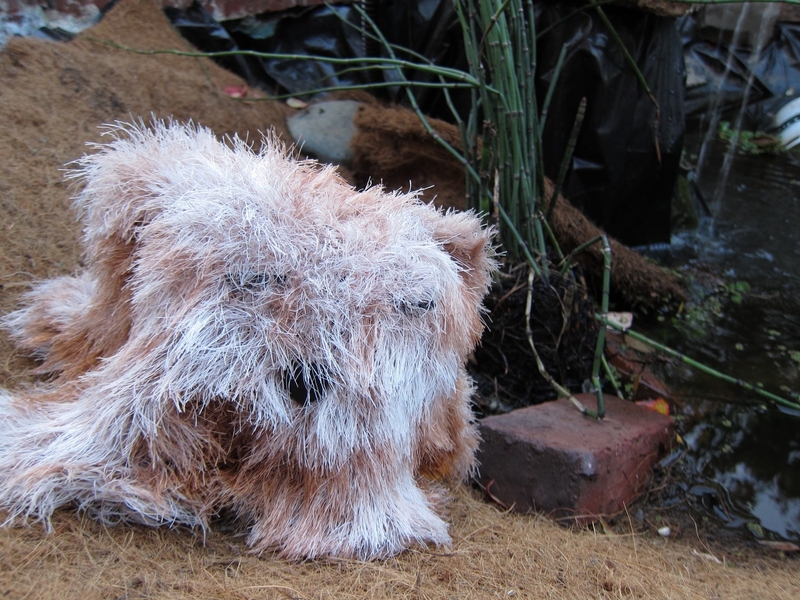 The Emotional Buddies record how hard they are squeezed using resistive yarn. They needed to be self-enclosed and glow from within, but I didn’t want the feel of electronics to interfere with the experience of squeezing them, so I enclosed the electronics in a thick silicone pocket before I inserted them into the plushie. The result was flexible, secure, and squishy. 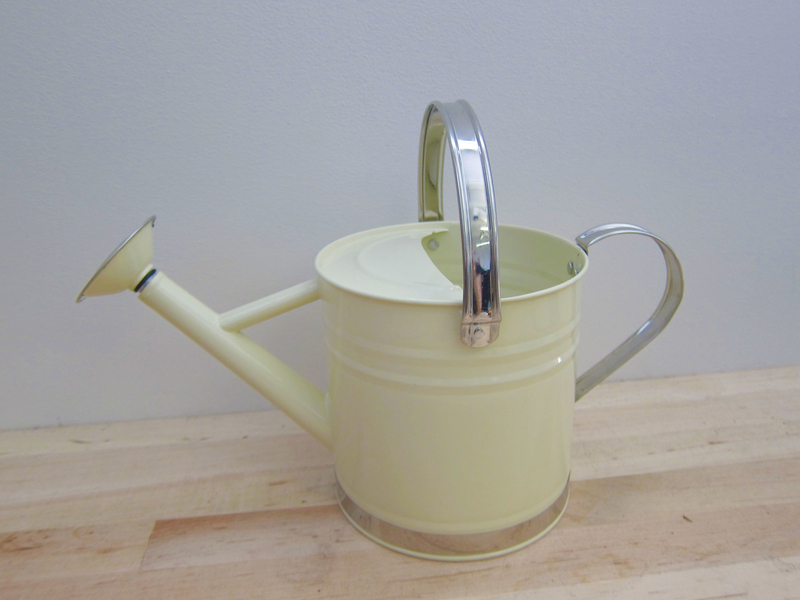 Tip this empty watering can anywhere in the world, and a cactus garden will water itself. As a Lab, we spent a lot of the last year talking about long distance relationships and the struggle of caring for someone who is far away. While I like the metaphor and it makes a nice Wi-Fi demo, Water for the Desert is probably a destructive paired object, and I don’t recommend it for folks in actual long distance relationships. Water for the Desert is a pretty straightforward Wi-Fi connectivity demo-- the watering can and plant shower are both connected to the internet through Wi-Fi widgets. 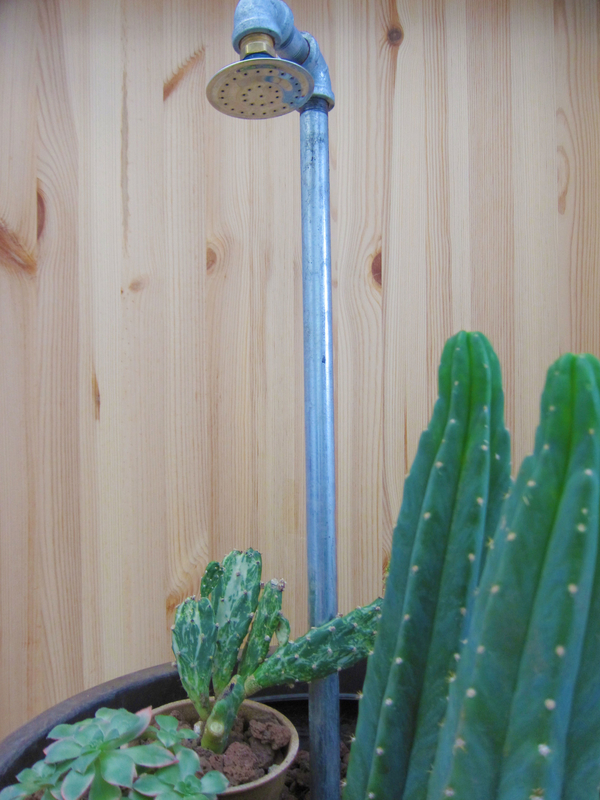 A tilt sensor recognizes that the watering can has been tipped, and the two Particle Photon microcontrollers communicate to set off a pump under the plant shower. Notclock and notwatch never show the time of day. Instead, they show the color of the sky. We get a lot of exact time through notifications and clocks. What we’re starting to miss in our indoor lives is the sense of time passing as day fades to night. Notclock is a porthole to the sky and provides a more ambient sense of time. An object that changes slowly over the course of a day makes for a crappy demo at a two hour event. For the live exhibition of notclock, I built a dial that guests could turn to set the clock to a particular time of day. The dial was a Particle Internet Button I had on hand: the accelerometer judged the rotational position and changed the color of the LED both locally and on all of the notclocks in the exhibit.